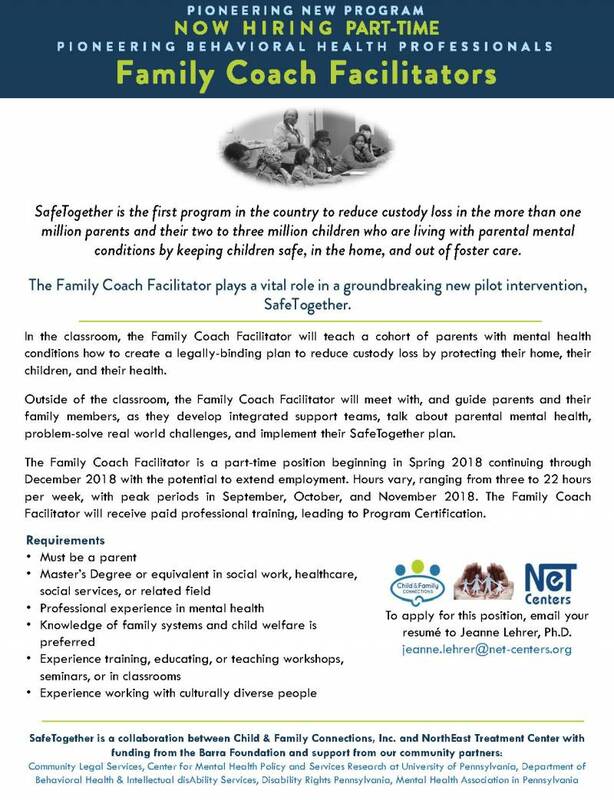 Family Coach Facilitator Position - Child & Family Connections, Inc.
SafeTogether is the first program in the U.S. to reduce custody loss for parents with a mental health condition. The program teaches parents how to legally keep their children safe and in the home while protecting their household and finances. Additionally, parents determine the healthcare treatment they prefer. The successful candidate has a passion for coaching, working with families, strong leadership and problem-solving skills as well as the ability to facilitate large group workshops. The Family Coach Facilitator is a part-time position beginning in early 2018 and continuing through December 2018 with the potential to extend employment. Hours vary, ranging from three to 22 hours per week, with peak periods in September, October, and November 2018. The Family Coach Facilitator will receive paid professional training, leading to SafeTogether Certification and may help shape the program in a consultative manner. To apply for this position, please click here to email your resumé to Jeanne Lehrer at NorthEast Treatment Center.